This is a reliable series, full vision, glass display case. Please choose from the available options. Aluminum frame gives added stability. Tempered glass allows for customers to easily view items. 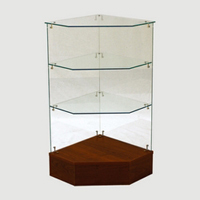 This frameless glass corner display has open shelves from which you can merchandise. It can be used in a corner against a wall or as part of a larger case run to turn a corner. Just put two other cases up against the the perpendicular sides and you will have an "L". Full vision display case comes equipped with two tempered glass shelves and solid sliding rear door. Full vision design allows in more ambient light to display area. 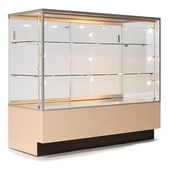 This full vision display case features a 29" high glass display area. Shipped pre-assembled for your convenience. This display counter would make a great addition to any retail space. The simple and functional design gives a very professional look. This glass display case is shipped pre-assembled for your convenience. There are four halogen lights built into this display case to provide you with the most consistent lighting possible. Available in 40" or 48" widths to fit your specific display needs. This case has available lighting for install. Lights are a great way to properly illuminate you’re items and ensure that they are always visible in any lighting condition. 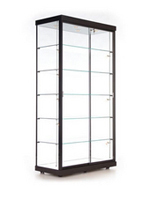 This is a reliable series, glass jewelry display case. Please choose available options. Aluminum frame gives this display case added stability. Tempered glass allows customer to easily items on display.